I’ve been working hard to be more courteous when speaking by telephone with customer representatives. As part of that effort, I’ve been reflecting on what drives me to be rude and sarcastic. One important factor is that I rarely call up some large company for a happy purpose — it’s almost always a problem. Whatever has happened — a billing error, a product failure, a problem with an order — 90 percent of the time, it’s the company’s screw-up. So, when I have to call customer support, it’s an interruption to my work, and I’m already primed for conflict. The pressure to respond with asperity mounts to the extent that the customer-service experience stinks — having to navigate through phone-menu options none of which apply, having to wait on hold, encountering a representative who can’t help me with the problem or is poorly trained or is not empowered by the company to do the right thing for the customer. Fortunately, I’m usually able to maintain enough perspective to recognize that the customer representative is usually as much a victim of the company’s abysmal approach to customer experience as I am. Like most of us, the rep is just a poor soul trying to make a living within the limits of the reality they are presented with. Unless the rep is as incompetent or uninterested in the customer as their employer is — in such case, the individual might warrant some castigation. I often take the opportunity of the interaction to ask the representative to pass along my feedback about what is wrong with their company’s customer relations. Like throwing a stone into the ocean, but who knows, someone might listen. I would have to say that most of the time my experience with telephone customer service is negative, but normally that doesn’t justify mistreating the human being who is trying to help me. Most marketers would say that good strategy requires you to treat your customers well — turn them into raving fans and they will recommend you to friends and family. In the online world, good reviews and links from grateful customers will contribute to good search-engine optimization (SEO), that much-sought collection of factors that results in high rankings in search engines. I would hate to contribute to the success of the retailer profiled in Segal’s article, so I’m not going to name him or his site. 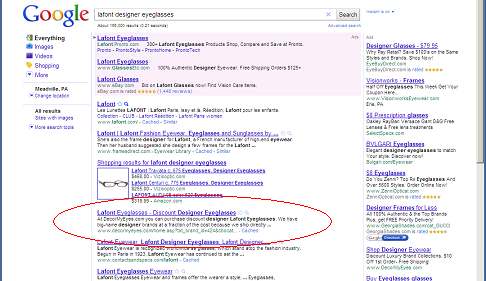 This SEO contrarian runs an e-commerce business selling designer eyeglasses. Segal interviewed one of his customers who says that when she complained and tried to get her money back after paying for fake designer frames, she received threats of sexual violence, phony legal documents, harassing phone calls, and a threatening email with a photo of the building where she lives and an “I am watching you” message. Hello, My name is ********* with *********.com I just wanted to let you know that the more replies you people post the more business and the more hits and sales I get. My goal is NEGATIVE advertisement Its a new proven to work strategy when you post all kinds of negative it always turns positive. I never had the amount of traffic I have now since my 1st complaint. I am in heaven.. Thanks so very much for your continued effort. I really appreciate it. The only real limit on his antics is imposed by Visa and MasterCard. If too many customers successfully dispute charges in a given month, he can be tossed out of their networks, he says. Precisely how many of these charge-backs is too many is one of the few business subjects that Mr. ********* deems off the record, but suffice it to say he tracks that figure carefully and dials down the animus if he’s nearing his limit. Until the next month arrives, when he dials it back up again. The listing for the master of dysfunctional customer relations is third in organic search results. Mr. ********* typically works from about 10 a.m. until 5 the next morning, spending much of that time feuding with unhappy customers. He describes this grueling regimen of confrontation with a heaviness that is enough to make you want to give him a hug. The Times-Reporter of new Philadelphia, Ohio, reports that police searching for a potential suicide victim were thwarted by a Verizon Wireless operator who refused to turn on the customer’s cell phone so the p0lice could use a nearby cell tower to locate the victim. This kind of intransigence makes me think that Verizon Wireless has been unsuccessful at implementing a key practice in good customer relations: Empower your people to do the right thing for the customer. Williams said he attempted to use the man’s cell phone signal to locate him, but the man was behind on his phone bill and the Verizon operator refused to connect the signal unless the sheriff’s department agreed to pay the overdue bill. After some disagreement, Williams agreed to pay $20 on the phone bill in order to find the man. But deputies discovered the man just as Williams was preparing to make arrangements for the payment….